Several different remediation processes are available to clean up soil, varying in efficiency, cost and sustainability for specific site conditions. When officials suspect a site is contaminated, they conduct an assessment to determine the pollutant, the extent of contamination and the appropriate method to remediate the soil. The clean-up process involves more than a broom and a dust pan. Soil must undergo remediation — the process of removing pollutants and contaminants from the ground. Several different remediation processes are available, varying in efficiency, cost and sustainability for specific site conditions. When officials suspect a site is contaminated, they conduct an assessment to determine the pollutant, the extent of contamination and the appropriate method to remediate the soil. 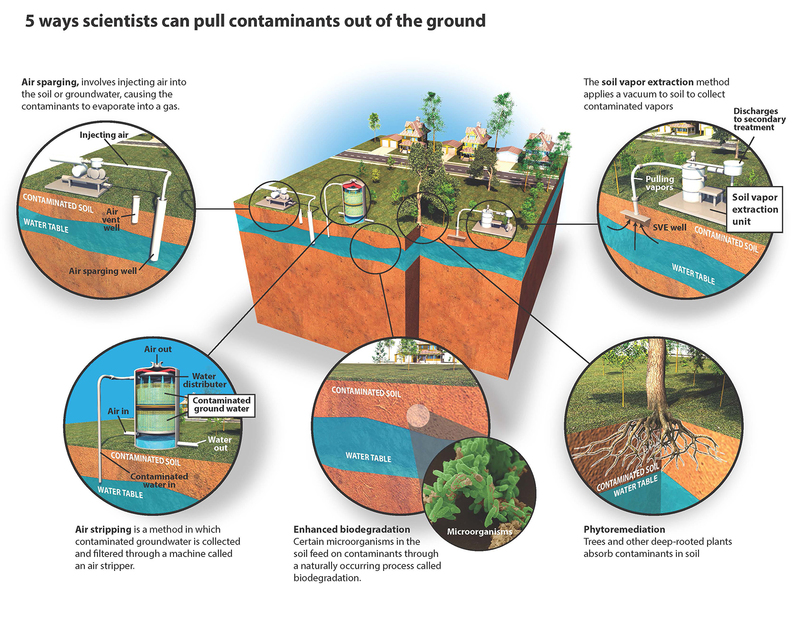 The Applied Geosciences and Environment Management Program at the U.S. Department of Energy’s Argonne National Laboratory evaluates potentially contaminated sites and applies remediation methods, such as those described below, that are both efficient and environmentally friendly by reducing secondary impacts — such as emissions from trucks that transport soil to a treatment facility. Air sparging, also referred to as soil venting, involves injecting air into the soil or groundwater. The air moves horizontally and vertically through the soil, causing the contaminants to evaporate into a gas. This method works best for contaminants that easily evaporate, such as crude oil. Air sparging is an example of an in-situ remediation method, in which the contaminated soil does not need to be removed. In situ methods tend to be more environmentally friendly than those that are ex situ, where the soil is first removed and then treated at the surface, said Lorraine LaFreniere, an Argonne geological engineer who leads Argonne’s Applied Geosciences and Environment Management program. Air stripping is an ex situ method specifically for water, in which contaminated groundwater is collected and filtered through a machine called an air stripper. The groundwater goes into the top of the machine and cascades to the bottom as fine droplets, while air enters from the bottom and is forced upward. The air strips away the contaminants as it rises through the droplets and exits through an opening at the top. Determining whether to use an in situ or ex situ process depends on how the contamination is distributed throughout the soil and to what depth, researchers said. For example, if the contaminated soil is buried under clean soil, the clean soil would have to first be removed. Nature itself tries to help eliminate soil contaminants through a naturally occurring process called biodegradation. Certain microorganisms in the soil feed on contaminants, such as tar deposits. Argonne researchers, in collaboration with other scientists, found that injecting zero-valent iron — iron in its elemental form — into the soil accelerates natural biodegradation. “We injected slurry mixtures of zero-valent iron and organic matter into soils and observed that it speeds up the process considerably,” LaFreniere said. Trees offer shade on a sunny day, but they can also remove contaminants from soil through phytoremediation. Trees and other deep-rooted plants absorb contaminants in soil and incorporate the contaminants into their tissues; plants also ​“breathe” volatile contaminants to the atmosphere, where they dissipate. Plant-based remediation is good for contaminants, such as carbon tetrachloride, a chemical that was primarily used as a fumigant and dry cleaning agent until it was banned in the 1970s as harmful to human health. Argonne researchers are also using trees to monitor their progress when using phytoremediation. The scientists measure the amount of contaminants in samples of branches and tree cores to assess how much has been removed. Sometimes, all you need is a really big vacuum. The soil vapor extraction method applies a vacuum to the soil to induce air flow and get soil vapors moving. Researchers collect the contaminated vapors in extraction wells and treat them aboveground. This is a useful remediation method when the contaminants are already in a vaporous state or are liquids that readily evaporate, such as methane and propane. These vapors can make their way into homes and businesses and may cause people to become ill.
Funding for LaFreniere and Negri’s research comes from the U.S. Department of Energy’s Office of Environmental Management, the Commodity Credit Corporation and the U.S. Department of Agriculture. To find out more about Argonne’s environmental research, visit the Environmental Sciences and Energy Systems websites.